The Exchange has a component based flexible architecture, for anonymous order matching, real-time reference pricing and margin monitoring, guaranteeing price transparency, prompt and reliable order routing, trade reporting, market data dissemination, and market surveillance. The heart of our trading platform, the matching engine has earned the trust of the market participants over the years. Besides efficient and fast price discovery, the matching engine strives to maximize Social Welfare as prescribed under the CERC Power Market Regulations. The Exchange provides Trader Work Station (TWS) and Member Admin Terminal (MAT) to its Members. MAT is used by members to place bids on behalf of its users and to do surveillance of users on real time basis. EAT (Exchange Admin Terminal) provides the interface to the Market Operation team of the Exchange to efficiently perform daily operational tasks. The Exchange also supports native protocols (CTCL – Computer to Computer Link) for connecting to the Exchange for trading. To mitigate risk, the Exchange validates capital adequacy continuously by tracking Member’s margin utilizations, and enforces the integrity of trades by limiting exposure. The value limit is derived by In-house system (Clearing and Settlement System) based on the collateral and bank balance of the member by applying haircut if defined. An in-house technology team design and develops our electronic trading platform which is proven, reliable and tested technology contributing sustainable competitive advantage. Operating in a dynamic environment that continuously challenges us to evaluate, update and provision technologies, and respond to the regulatory changes and market needs. With technical expertise and depth of experience, the Exchange continually strives to develop new products and services. Over last ten years of successful operations, the Exchange has demonstrated that its technology platform has the potential to drive revenue with increasing volumes. The Exchange plans for and structure its business based on its past experience and future expected growth. 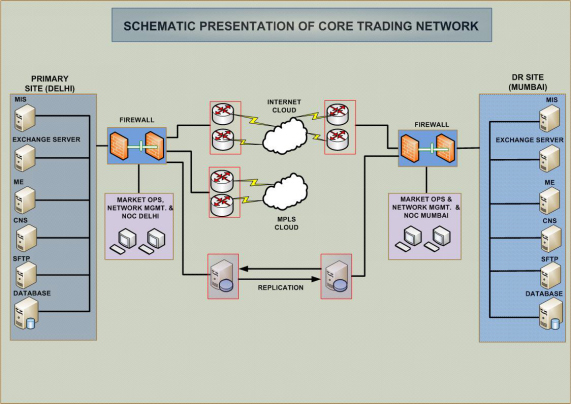 The schematic diagram below depicts Exchange’s core trading system architecture along with key trading components. The core trading system infrastructure and architecture is identical for Day Ahead Market (DAM) and Term Ahead Market (TAM) and Energy Certificates (EC) Market.